What Cycle? is the complete buyer’s guide for new bike hunters in 2014. The debut issue is packed with 50 full bicycle reviews — comprising roads bikes from £380 to £5,299; mountain bikes from £495 to £5,499; utility bikes from £550 to £1,500; and e-bikes. Highlights include a sub-£2,000 carbon sports bike megatest — with bikes from Scott, Pinarello, Lapierre, BMC and Eastways going head-to-head — and there’s an in-depth look at five very different mid-range mountain bikes. What Cycle? also rounds up some of the best hybrids on the market and group tests helmets, shoes, saddles, base layers, bib-shorts and upgrade wheels. Then there is the UK’s most comprehensive new road and mountain bike listings, with each model catalogued alongside its most important data. Finally, What Cycle? features essential bike buying and fitting advice to ensure you make the perfect purchase. So whatever your bike buying intentions, What Cycle? will help you choose your next bike with confidence. What Cycle? 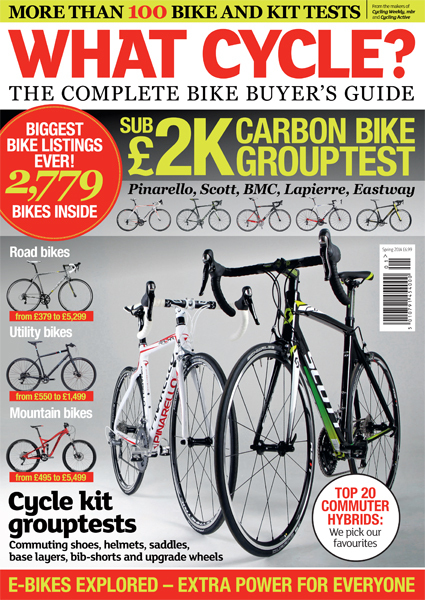 – The Complete Bike Buyer’s Guide Spring issue on sale now priced £6.99 at WHSmith, major supermarkets and all good newsagents.